We took a tour of Memphis Barbeque and I consider Memphis to be the center of the universe of Wonderful Smoky BBQ. The hands down winner of the best ribs in Memphis is COZY CORNER! Cozy Corner is off the beaten path, up near St. Jude's Hospital, and is sort of in a no man's land. That is a good thing because there is more parking room for clients at this fabulous establishment. The service is friendly and competent time and time again, and that is a welcome change from the surly and non-helpful teenage waitstaff on Beale Street. I get the "dry ribs" meaning, only delicious smoky flavor and a secret dry spice rub on the outside. 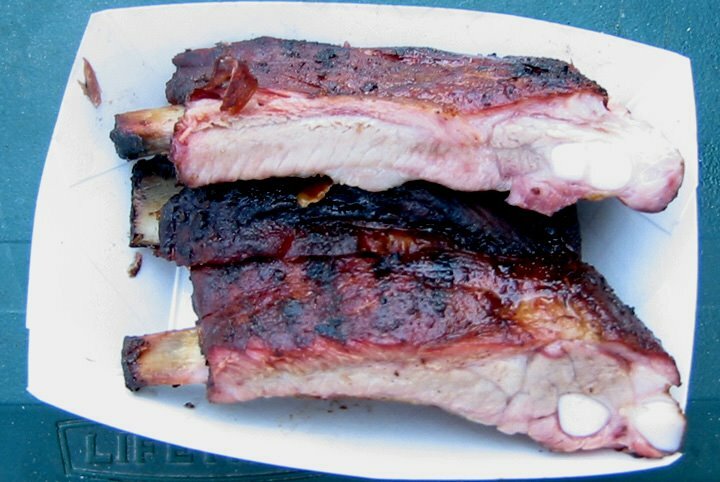 The meat is slowly cooked over smoldering charcoal and wood, and it is the most lovely, savory, moist, and soul-tingling sensation to eat these ribs. Because so much time and effort has been put into making a complex smoky rib, adding too much bbq sauce would just kill the delicate nature of this meat. I also took home a rack of ribs to enjoy for a couple of days. These ribs are so deeply smoked to the bone, that re-heating these gems in the over or microwave re-awakens the fabulous flavor. It is so worth bringing extra Cozy's home! Cozy Corner is a MUST VISIT everytime I am in Memphis. 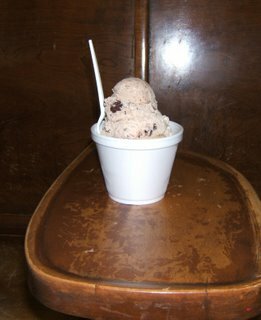 If you are in Memphis, remember, Cozy Corner is only open Tue-Sat 10:30am - 5pm, and if you are late, you are S.O.L. 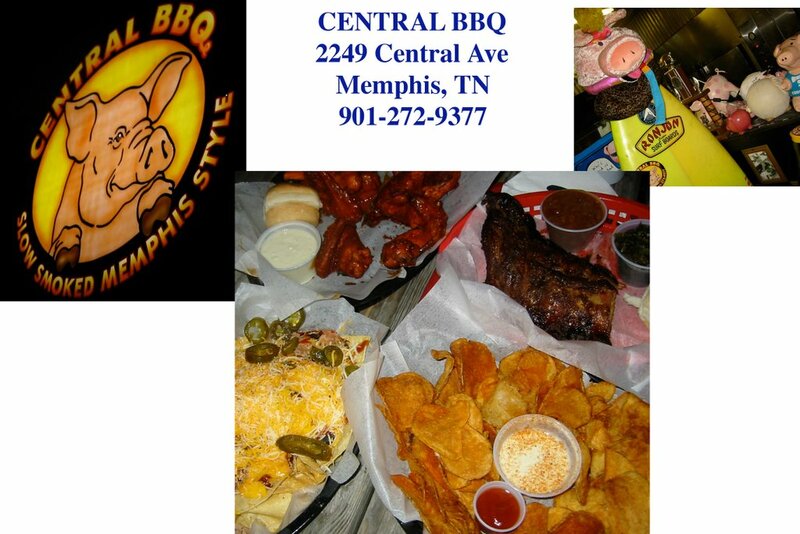 The 2nd runner up on my list is Central BBQ located in midtown Memphis. The dry ribs were good, service is fast, and they got a few unique dishes that are creative with bbq. 1st off, the dry rub tastes like a lay's bbq potato chip, and Cental puts the rub on everything. The ribs were not as meaty as Cozy Corner's, but are a good meal. One unique dish was the bbq nachos which were tortilla chips covered in pulled pork bbq and bbq sauce, cheese and jalpenos - surprisingly good. The other one are the handmade chips covered in the bbq rub, and these tasted like freshly made commercial bbq flavored potato chips. The 3rd is TOPS Bar-B-Q. This location is also in Midtown Memphis, and is set up like a fast food chain. This bbq joint does not serve up ribs, but they do serve up a very moist, flavorful chopped pulled-pork sandwich with a spicy bbq sauce. I got some krinkle fries, strawberry soda, and a sandwich which I enjoyed quite a bit. This place is open on Sunday's unlike most other bbq places in Memphis. 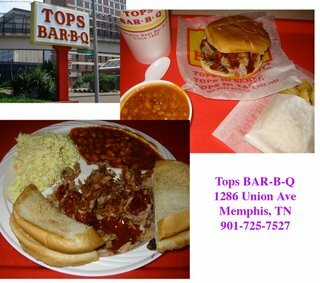 Tops was a good option when I was ready to roll out of town on Sunday, and I wanted to have one last fling with bbq. 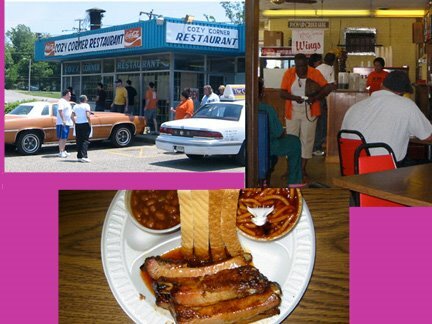 Other places we ate at in Memphis were Blue's City Cafe, Interstate, King's Palace Cafe, Huey's, Automatic Slims, and Rendezvous. Blue's City is open until all hours of the morning, on the busiest corner of Beale Street, and perfect for a little midnight dry rib bbq snack after bar hopping. King's Palace isn't really a rib joint, but has a funky atmosphere, in-character waitstaff and is a nice A/C break from the hot humid weather of this Mississippi River town. Interstate can be found on the famous Mississippi Highway on the way out of town towards Mississippi. The ribs are good, but the unique dish at Interstate is the bbq spaghetti is a thing that is fun for about 3 bites, and then you need to share with your dinner mates. The biggest disappointment was Rendezvous. It is a big tourist destination, and they sell their dry rub which is spicy and savory with paprika, mustard seed, and pepper. The rub is great, but the dry rib quality is lacking. It tasted like they boil the ribs first before grilling the ribs, there is a lack of deep smoky flavor, and the ribs were dry. This all indicates that they smoked the ribs quickly and over too high of heat for too long. I suggest people try Rendezvous if they must, due to all the hype, but there are better places like Cozy Corner, Interstate and Central. We did take a break from all the bbq and we went to Huey's sport bar, a couple blocks off of Beale St, and discovered a kielbasa and cheddar dish. It is fried slices of kielbasa and chunks of chedder on a styrofoam plate. Actually everything is served on styrofoam with platicware. It was greasy but strangely delicious! We also went to Automatic Slims, right around the corner from Huey's. Automatic Slims has a sleek interior decor, a decent wine bar, and artsy American food with a caribbean edge. It seems that Automatic Slims is completely the opposite of a down home bbq joint, and I am sure the suburban "trying to be cool" crowd eats here. At anyrate, go to Cozy Corner if you want the best smoky rich flavor of dry ribs (gotta order "dry ribs" not just ribs). If you do not try the ribs, then you will leave, always wondering what the best Memphis bbq is like, and you really don't want to have that question hanging over your head. 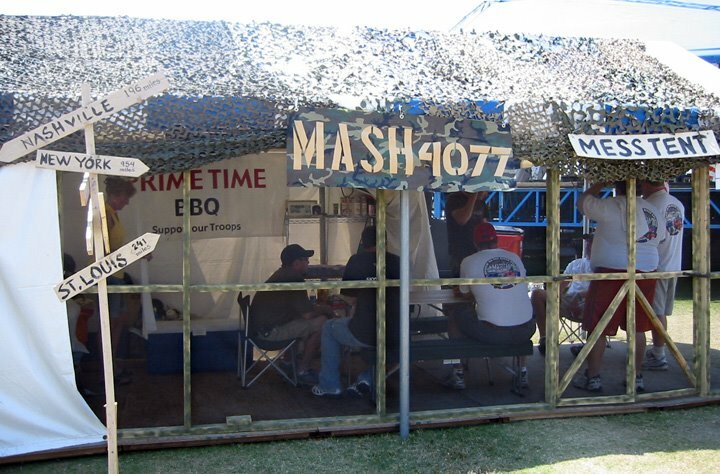 Memphis in May holds THE WORLD BBQ Competition annually, with a cash prize of $8000 for the winner! The BBQ Pit teams, are serious BBQers, with smoky aroma abounding. The teams build camps along the Mighty Mississippi, and hunker down with BBQ rigs that are so huge, only a semi-trailer could pull, and others have made specialty shapes like pigs, bulls, boats and even an Air Force Fighter jet. Each Pit team has their own secrets of spices, woods, charcoals, time, turning, and not one Pit team is telling any of their secrets. Definitions of BBQ and grilling as I see it: BBQ IS NOT GRILLING! BBQ is a slow cooking method over, or indirectly near, mature coals and wood, and generally the meat BBQed has no bbq sauce on it, rather the meat has a dry rub of spices, salt and pepper and if sauce is added, it is mopped near the end to give it a nice thin shine without the acrid taste of burnt sauce. Many of the top BBQers do not use sauce because why cover up the amazingly delicious and subtle smoky flavors with a heavy bbq sauce? Grilling is what you do at home to a steak or burger, usually a quick cook over hot coals. 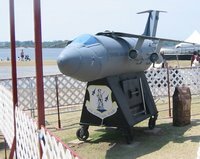 We took the tour of the Memphis in May BBQ competition. 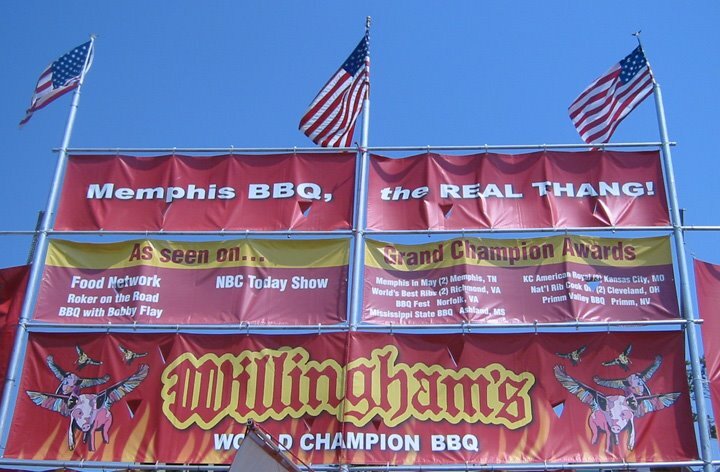 Inside the competition we ate Wilingham's 2 time Memphis World BBQ Champion dry ribs. These ribs were moist, smoky flavorful, good color profile, and the secret dry rub was an exacting thin layer of flavor. I can see why they are a 2 time champion. 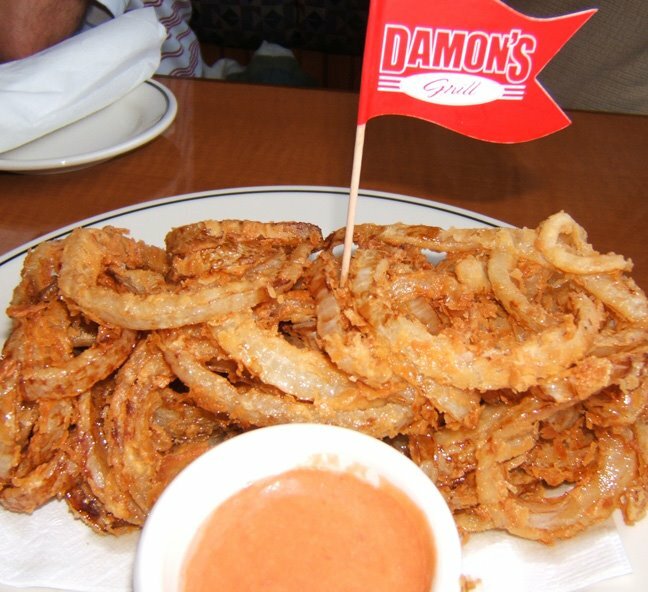 There are Damon's all over the midwest, and is a chain steakhouse. Damon's has ribs, steaks and prime rib. Myself being from the south, would not get the ribs because good ribs only come from great smokehouse roadside joints. What would a visit to a steakhouse be without a fried onion? Damon's is known for it is greasy and yummy onion loaf. 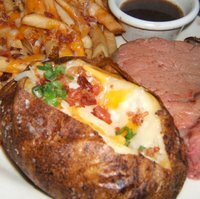 Everytime I am in Sandusky, I usually go and treat myself to primerib at Damon's with an onion loaf, and a loaded baked potato. 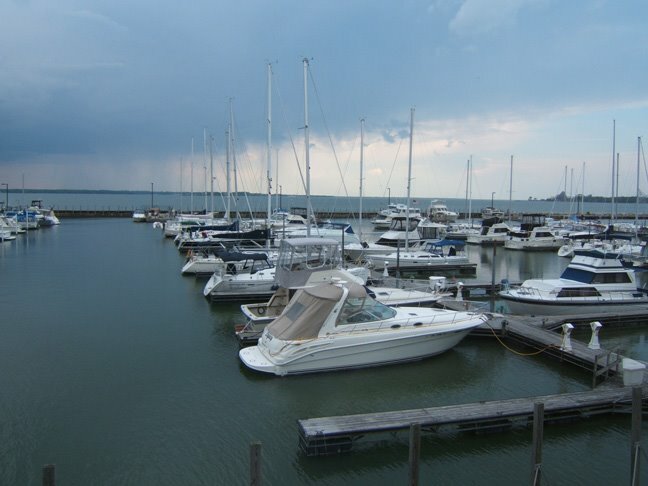 The best part about this Damon's is that it is not a sports bar (some other Damon's locations are loud sports bars), and this one has an excellent view of Lake Erie and Cedar Point Amusement Park. This meal that I had recently has fries and a loaded potato. I did not order the fries, rather the waitress made a mistake and brought the fries first, and then corrected the order with a potato. 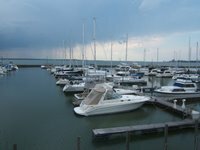 Honestly, I just love the view of this Great Lake while dining. I am really lucky to be able to sit at a table with a view every time I am at Damon's. Tofts Ice Cream Parlor is locally owned and served locally made ice cream in huge quantities. 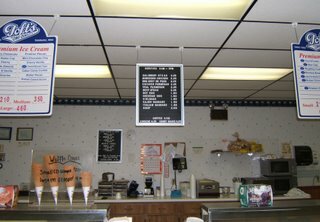 You get 4 big scoops for about $2.10. At lunch time, there are specialties, like hot dogs, chili, shredded chicken sandwich, bbq beef or pork sandwich, sausage sandwich, soup and other delites for the cost of $1.50 - $2.50 each. If you have a trip to the grocery planned, you can cut your grocery list by purchasing your dairy, bread and snack products here. You can take home a gallon of locally made milk, yogurt, local honey, potato chips and a loaf of bread for your pantry. I took some yogurt and raw honey home, and both were devine. 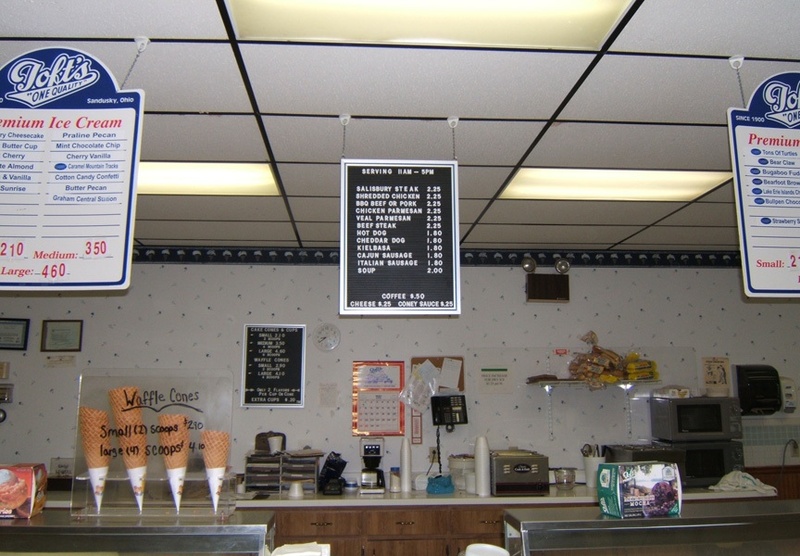 Ice cream flavors come in all sorts of varieties that you can think of, including vanilla, chocolate, butter pecan, moose tracks, cookie dough and chocolate almond to name a few. Check out my "small sized" ice cream in a cup. Note, the cup is PINT size, filled with ice cream, and over flowing ! I suspect I got nearly one quart of ice cream that is all about the creamy goodness.